Social media has changed so much about the way we communicate today: how we share and acquire information, how we connect with others, and how we learn about our world. As a result, effective online marketing for small businesses should ideally involve a good social media for small business strategy. So what is social media, exactly? Social media includes websites and applications that allow users to share content and engage with other users. The most well-known platforms include Facebook, Twitter, Instagram, Google+, Pinterest, Snapchat, and more. Learning how to use social media to promote your business, like other small business challenges, may be overwhelming at first, but you’ll probably find that once you dive in and experiment, you’ll get the hang of it. Social Media for Small Business: Why Bother? Awareness: Having a social media presence for your business means potential clients are more likely to be aware that your business exists. This means that they’re more likely to think of you when they need the service or product you’re offering. Connecting with your audience: Social media platforms allow you to interact with your audience, and make it easy for them to reach you if they have a question or concern. The social network: When your clients engage with your content and share it with their own networks, they naturally promote your business without additional investment on your part. There are so many platforms, and each one has its own “culture,” functions, advantages, and disadvantages. But don’t worry–you don’t need to have a significant presence on all of them! If you already have social media profiles for personal use, start with the platforms you are already familiar with, and as you get comfortable using them for your business, consider joining more. 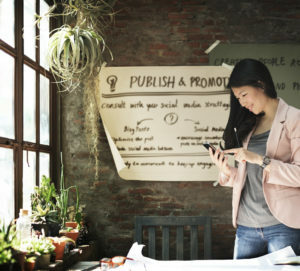 Be aware, though, that using social media to promote small business is a little different from using it to connect with your friends. Many platforms offer business accounts that have different features than personal accounts. On Facebook, for example, you’re not allowed to use your personal account to promote your business; instead, you’d open a business page. On Instagram, you can choose between a personal and a business account, the advantage of the latter being more promotion options, though there are arguments against it. Twitter, on the other hand, doesn’t differentiate between personal or business accounts. Aside from your own comfort level, another crucial consideration when choosing which social networks to join is: where is your audience? Be aware that this may shift from time to time. Facebook started out as an exclusive network for college students, but as older people started using it, the younger people started drifting away to Twitter and Instagram and Snapchat. If you try out a social media platform and you just can’t get the hang of it, don’t worry. It’s better to invest your time producing high-quality content to share on a network you know how to use than to waste time and energy figuring out how to market a small business using a platform you can’t wrap your head around. Once you’ve decided which social media platforms to use, it’s time to set up your social media for small business accounts. One thing that can be incredibly helpful is using a social media management tool you can use to manage several social media accounts at once–such as HootSuite or Buffer. These tools make social media and small business marketing so much more convenient, because you can use them to schedule posts and post to multiple platforms without needing to log in to separate accounts and manually post to each one. Your username, handle or business page should be named after your brand or business name to make it easy to find. You can use your logo or your professional headshot as your profile picture. How often to post: The recommended posting frequency varies from platform to platform, and also depends on your business goals. What kind of content to share: What kind of content is your audience most likely to engage with? Inspirational quotes? Instructional videos? Articles? Blog posts? You can experiment and see what works best. Brainstorm ideas and schedule them in; that way you don’t have to rack your brain every day about what to post, and can turn your attention to other things instead. Any marketing strategy will involve distilling and emphasizing what it is about your business that sets you apart from your competitors. Is it your prices? Your experience? Your quality and reliability? If you have general liability insurance, you’ll start out a league above competitors who don’t, because your clients will know you are stable and they can depend on you. Think about what it is you’d like your clients to know about you, and see if you can insert that message subtly into your content. How to reach out and get more followers in your social media for small business really varies from platform to platform. On Twitter and Instagram, for example, using popular hashtags related to your business can help people find you, whereas on Facebook hashtags are not used as often. One thing you can do on Facebook, though, is create and run a group on the topic of your expertise, where you can offer tips and advice and invite people to share and discuss. You can also hold live events using FB Live to interact with your followers in real time. Instagram and Twitter also have live broadcast functions that help increase engagement. You can also spend some time each day searching for other accounts to follow and interact with, in hopes that they’ll reciprocate. The more people you interact with, the wider you spread your net. People don’t want to engage with businesses; they want to engage with other people. So presenting yourself as genuine, friendly and generous on social media is one of the best ways to maximize engagement. Be yourself, and have fun! © 2019 Next Insurance inc. Issuance of coverage is subject to underwriting. Not available in all states. Please see the policy for full terms, conditions and exclusions. Coverage is dependent on actual facts and circumstances giving rise to a claim. Next Insurance Inc. is an insurance agency licensed to sell property-casualty insurance products and receives compensation from insurance companies for such sales. Policy obligations are the sole responsibility of the issuing insurance company. Refer to Legal Notices section for additional information. Next Insurance, Inc. does business as Next Online Insurance Services in California, Michigan, Minnesota, North Carolina, and Texas and as Next Insurance Services, in New York, North Dakota, and Virginia.